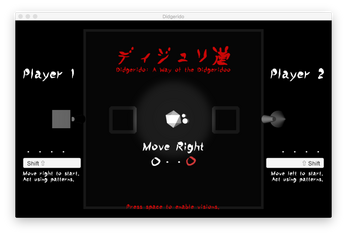 Didgerido is a local two-player rhythm combat game that uses an optional single-image random dot stereogram display during the match. Blow your didgeridoo in time with the drums to hit your opponent or play alone for meditative practice. Legend says that this way of the didgeridoo way founded by a komusou monk from Japan, an escaped capoeirista from Brazil, and an iconoclastic dreamer from Australia. A form of solo meditation. A way to practice deadly didgeridoo moves disguised as an improvised, playful dance. A new way to see and experience other dimensions without technology or drugs. Didgerido is all of these, and more. But devoting your life to didgerido is a big decision. This game gives you a taste of what walking that path would feel like, either in quiet solitude with headphones or with a friend also considering the path over speakers. Use a shift key to enter a command pattern with the beat. Compete to the first touch of your didgeridoo upon your partner, or leave the mat to complete your session. Listen to the drum for guidance. And should you find that digerido speaks to you, please consider giving alms to support future work. Blow in peace, friend. o indicates starting to blow; . indicates additional beats. Press your shift key on a beat to start blowing. If you miss the beat, you'll hear a higher-pitched sound. I can't see anything but dots! 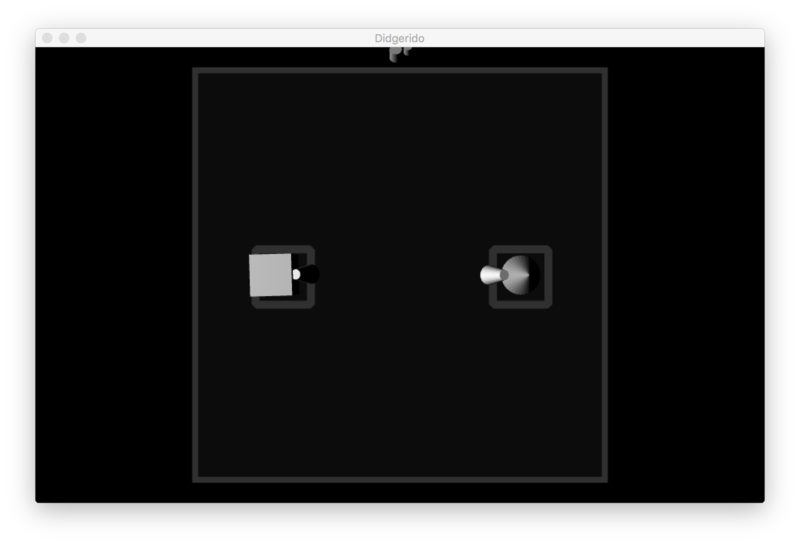 It's easier to start with a static image: The second and third screenshots show the same scene. After you can see them, seeing the scene with the moving dots will be easier. Try putting up two fingers and moving them until you see double (i.e., four fingers). Then line up the middle two so it looks like you have three fingers. Keep that focus and look at the screen. If that doesn't work, read this. Or you can turn off the stereogram with the space bar during the match. 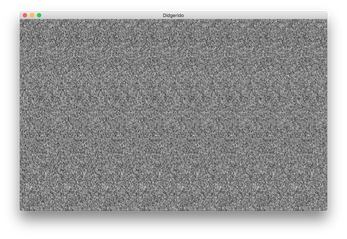 Added a configuration file to fine-tune the single image random dot stereogram (SIRDS). 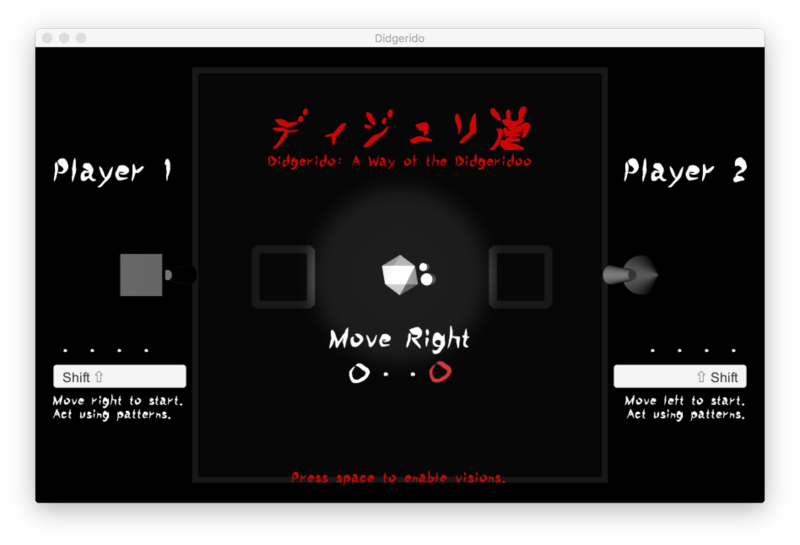 Arrow keys during a match now control depth (up/down) and number of strips (left/right) for the SIRDS. Updated SIRDS defaults to be easier to see the 3D image for more people. Windows version now uses DX9. Fixed Windows rendering bug with black lines appearing on the bottom of the screen. Disabled accessibility prompt from appearing in Windows.